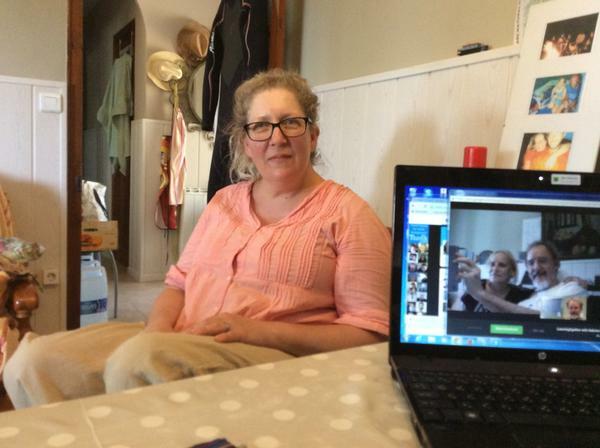 Sabrina Wilson often attends Learning2gether Hangout events, and she mentioned at a recent one that she lived in Altafulla on the coast of Spain between Barcelona and Tarragona. On Sunday July 5 Vance will be in Spain for the XVII International CALL Research Conference in Tarragona and Sabrina invited my wife and me to stop off at Altafulla for a Hangout on Air about how we have met in various online spaces associated with the Webheads in Action and Becoming a Webhead communities of practice before connecting face to face in Spain. http://wwwa.fundacio.urv.cat/congressos/call-conference-2015/. All are welcome to join us. Benjamin Stewart was there and he told us a bit about Microsoft Word Online and how he has been using it with students. He and Vance compared notes on how they have been teaching writing, Vance with voice in Google Docs, and Docs Story Builder for brainstorming. 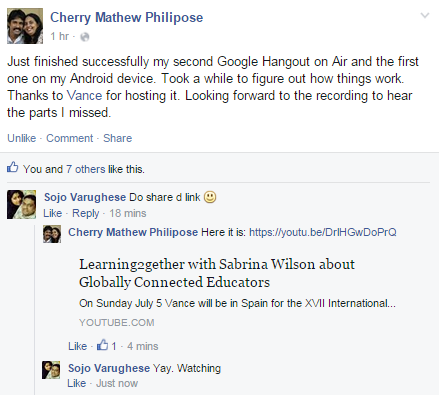 My name is Sabrina Wilson and I’m an English teacher at an after school academy in Spain. I teach children from 4 years old to teenagers and also adults. I joined the Becoming a Webhead group to learn more about using technology so that I can approach my boss about offering blended learning opportunities to teen and adult students asking for more activities outside of the classroom. Friday, June 26th – July 1st in Philadelphia, PA 2015 ISTE Unplugged, Each year hundreds of educators interested in social media, technology, teaching, and learning gather to build and participate in “unplugged”-style activities as a part of the ISTE (International Society for Technology in Education) conference. 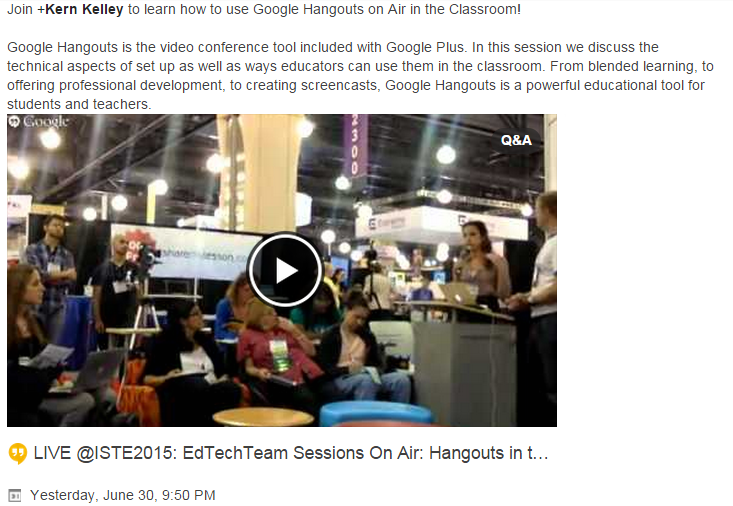 Go to www.isteunplugged.com and read below for details of this year’s events. We’re looking forward to seeing you there! Thanks to our generous friends at ISTE.org, our NINTH annual set of extra-curricular events at the ISTE conference this year will launch on the Friday before ISTE (June 26th) with an all-day open Maker Day–expect lots of table, activities, and fun for all ages, geared toward education. Saturday’s all-day unconference features special guest Audrey Watters again this year, and huge shout-out to this year’s unconference and evening party sponsor, StudyBlue and Shutterfly. Sunday is our fourth annual Global Education Summit, a three-hour event + connecting party you don’t want to miss. The Bloggers’ Cafe will be open Friday – Wednesday, and we’re really hoping to add an education slam poetry event still. Stay tuned for all events at http://www.ISTEunplugged.com, which also has Facebook event links for each activity.